Genuine French Trenet Absinthe in 70 cl Bottles and 4 cl Miniatures at 60 % Vol. Hapsburg Absinthe from Bulgaria in 20 cl and 50 cl Bottles at 72.5 % Vol. Hapsburg Absinthe from Bulgaria in 35 cl Bottles at 85 % Vol. Ask for the copy of the Original “ Solid Sterling Silver Absinthe Spoon “ – A special Gift for your friend ! First written recipe formulated by a Frenchman, Dr. Pierre Ordinaire . The Formula was passed to Henry Louis Pernod of Pontarlier in France , who opened his firstdistillery in Switzerland . 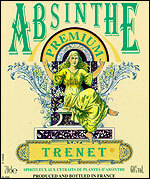 Many artists such as Monet, Degas, Picasso, painted or depicted “Absinthe “ in their Art. Absinthe was banned in Switzerland ! Absinthe was banned in France ! Historically it was widely regarded as a “ very dangerous drink “ and is still banned in many countries ! “Turn-of the century Absinthe was fiercely potent stuff ." The constituent herbs are macerated for about 8 – 10 days in alcohol and then distilled, the result being and emerald coloured spirit . Historically many believed that a spirit lived within the Absinthe which is released with the opening of a new bottle ! Some Artists even claimed they created their art dazzled with a “ jade vision “ inspired by Absinthe . At the turn of the 19th century, there was much hysterical press and allegedly serious articles and books on the subject…..
Art. 367. – The fabrication, the circulation and the possession with the aim to sell, and the sale of Absinthe and other similar liquors which characters are determined in the decree are forbidden. The classical method is to pour an ounce of Absinthe into a glass. Next place the Absinthe spoon on the rim of the glass and an appropriate number of sugar cubes near the slots. Now pour about five ounces of water, v.e.r.y. s.l.o.w.l.y, over the sugar to dissolve it. The other way to drink Absinthe involves dunking a spoon of sugar in the liquid, setting light to the spoon until the sugar has caramelized, then dripping the liquid sugar into the glass of Absinthe. Adding an equal part of water then puts out any excess flaming, and the drink is then poured into a cooler glass for drinking . Warning ! Absinthe is Extra strong and like any alcohol, excess consumption is very dangerous ! !